Our Duke stamped his class on the BoyleSports Irish Grand National to continue the golden season of trainer Jessica Harrington and jockey Robbie Power. Sent off the 9-2 favourite despite running in his first handicap and for just the fourth time over fences, the Grade One-winning novice never looked in any real danger. Following on from a Cheltenham Festival treble which included the Gold Cup success of Sizing John, Harrington and Power added the valuable Fairyhouse feature in real style. When Stellar Notion and Fletchers Flyer tired to leave Our Duke in front, Power just had to make sure the seven-year-old negotiated the last two fences safely. Gordon Elliott's Bless The Wings stayed on from a long way back to claim second, the same spot he filled 12 months ago, while the Ellmarie Holden-trained Abolitionist briefly threatened for Rachael Blackmore and took third, with Thunder And Roses (Mouse Morris) fourth. 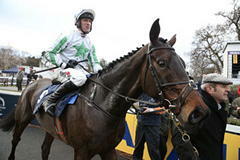 Barry Geraghty was an early casualty as his mount Minella Foru fell, bringing down Arbre De Vie. In truth, only a handful were ever involved on the front end, with Our Duke kept wide early by Power and apart from getting close to a couple, he jumped like an old hand. He was cut to 14-1 from 25-1 for next year's Gold Cup, with the current champion already in the same yard. As well as three Cheltenham winners, Power also won four races at Aintree's Grand National meeting, and said: "This means so much to me, it's my local racecourse and I was second in it a few years ago so this is nice compensation. He is a hell of a good horse. He is very, very good. "He made a few novicey little mistakes, but full credit to all the team at Commonstown. Jessie has done some job to train this horse to win an Irish National on only his fourth start over fences. "Once he got a good view of his fences and got plenty of light, we were going to be happy. He just travelled so well everywhere, he is just a very good horse. "Fair play to Fairyhouse as well, they done a super job watering the ground because otherwise he wouldn't have been here. Full marks all round to everyone. Hopefully I'll have a tough decision to make next March (for the Gold Cup), but who knows, we'll enjoy this one first." Harrington said: "It's unbelievable, I can hardly believe it myself. He's a novice, that was only his fourth run over fences but it just went like copybook the whole way. "Robert was convinced he would stay and my only worry was the ground, but he absolutely loved it. "The owners (Cooper Family Syndicate) also bred him and turned a lot of money down for him and they're fantastic." She added: "The Gold Cup and an Irish Grand National are all firsts for me, it's not bad for a 70-year-old! "He'll go nowhere else this season, that was the plan and it has worked. He's the same age as Sizing John, they are both seven. It's fantastic."